Tibet is a vast and thinly populated country where small groups of people live separated from each other by stretches of arid, deserted land. It is a region of high awe-inspiring mountains, of wild rivers, of steep dangerous gorges and of immense silent deserts. It is also a land of icy winters, of sudden violent storms and of screeching winds. The grim and forbidding face of Nature, combined with the weird atmosphere ‘created by climatic conditions, made the Tibetans preoccupied with the fearsome possibilities of their environment. All their hopes as well as fears were associated with it; it influenced not only their mind and character but also shaped their religion. Chief among the fears to which the Tibetan mind was prone was the belief in the unseen presence of innumerable evil spirits and malevolent forces which were waiting to harm human beings. To overpower these forces and to protect the individual believer as well as his religion, the Tibetan created a set of wrathful and terrifying gods, who were all protective deities.. These gods had pronounced frightful countenances. They were credited with powers strong enough to scare away and destroy even the most powerful and hideous evil spirits. There are numerous categories of wrathful beings in the Buddhist art of Tibet, including herukas, lokapalas, dharmapalas, and some wrathful dakinis. 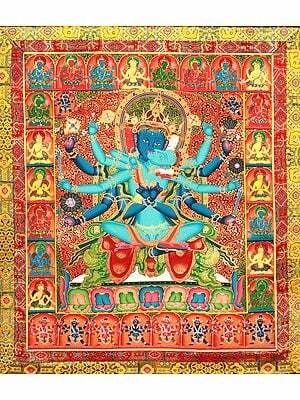 When propitiated these gods destroy the passions of the mind and protect the faithful. The emphasis in the composition of these images is always on the diagonal, and movement is expressed through the use of sharp angles at the joints of the limbs. The artist has chosen to exaggerate the posture of the body to better express the god’s inherent power and energy. 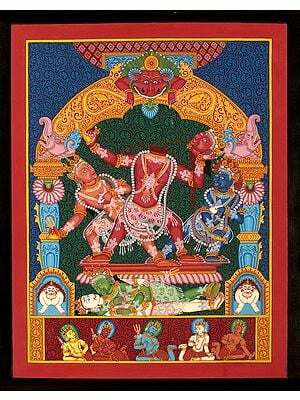 Often these wrathful deities are shown in vigorous physical embrace with their consorts. 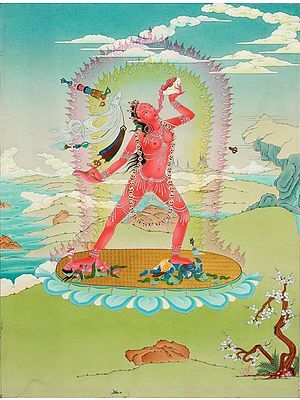 Such thangka paintings are highly symbolic and signify the union of compassion and insight, implying the non-polarized state of bodhicitta, or the mind of enlightenment.Tibetans characterize such images as yab-yum, which literally means father-mother; in Sanskrit the expression is yuganaddha (pair united). This metaphor is also used to denote the highest stage of yoga in which there is no polarity, no discrimination, and the truth is indivisible as the vajra itself. When these angry-looking deities are enshrined at the center of a mandala they suggest all the inner afflictions which darken our thoughts, our words, and our deeds and which prohibit attainment of the Buddhist goal of full enlightenment. Traditionally, wrathful deities are understood to be aspects of benevolent principles, fearful only to those who perceive them as alien forces. When recognized as aspects of one's self and tamed by spiritual practice, they assume a purely benevolent guise.